Before I proceed further, let me state upfront that I’m not a complete vegan yet. I do consume dairy products, out of habit (milk in my tea, curd). Though the quantity is less, I’m hoping I could put an end to it soon. I believe the commercially available dairy is harmful to health because of the various hormone injections, excess use of antibiotics etc. So I don’t consider dairy to be of any nutritional value, even though the media shouts on top of its voice with “high protein, high calcium” slogans. I had earlier written about plant-based sources of calcium. Do check it out if you haven’t yet done so already. Let’s come to the most “talked about” macro-nutrient - protein. I’m not going to get into the details of why we need protein. It is essential for various functions in the body, supports growth, maintenance and cell repair. What’s most relevant in today’s context is the requirement of protein. It is usually estimated based on body weight (0.8-1.8 grams/kg of body weight). For a sedentary person, 0.8 gm/kg of body weight is sufficient. But if you have a physically demanding job or you do intense workouts, the requirement will increase upto 1.8 gm/kg of body weight. Most of us would belong to the 0.8 - 1 gm/kg of body weight category. For an adult with 54 kgs weight, 43.2 gms of protein is needed. For a child with 18 kgs weight, 14.4 gms of protein is needed. Almost all children-targeted junk foods such as processed cheese, flavoured yoghurt, milk additive powders and milk supplements latch onto the “high protein” tag. If you look at the nutrition labels, the protein levels are very low. Even if they have adequate protein, they end up being high in sugar and/or salt, preservatives and artificial flavour enhancers. So it is best to look for natural, plant-based sources of protein than rely on packaged foods for our protein needs. Here’s a list of plant-based sources of protein I have compiled from IFCT-2017 tables. 1) Amaranth seeds (rajgira) are rich in protein, ahead of the much-publicized quinoa. Even though quinoa is rich in protein, it is not a native grain to India, has high food miles and is super expensive. 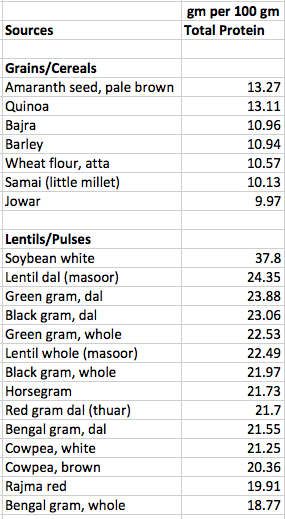 I had earlier written about why Indians don't need quinoa and how a typical combination of rice/millets + various dals can help us get complete protein. Do take a look if you haven’t already seen it. 2) Each region of India has various lentil-based recipes, from numerous varieties of dals, sambhar, kootu, bisibhelebaath, usal, adai, pesarattu, chillas etc. Many avoid idlis for breakfast, saying “Oh, they are carbs”. Made with urad dal and usually served with sambhar or chutney podis, what more protein do we need? Sambhar is usually made with thuar dal or moong dal. Chutney podis are made with urad dal, channa dal and healthy seeds like sesame seeds, flaxseeds or peanuts - all high in protein. Mixed with a tsp of gingelly oil, the meal is complete, wholesome and highly nutritious. But we would rather choose a slice of store-bought brown bread and a preservative-loaded, high-sodium peanut butter. 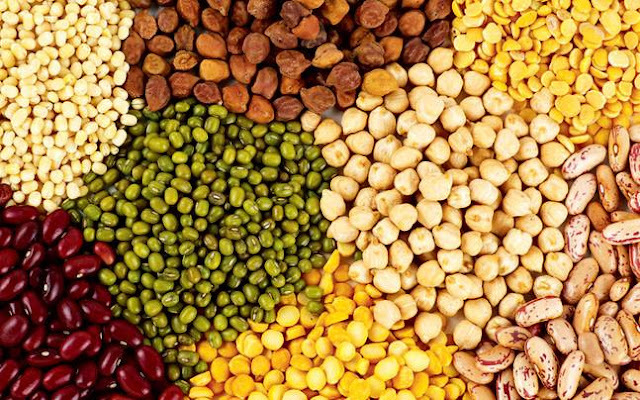 I seriously wonder why we need those expensive, artificial protein shakes and supplements, when our cuisines celebrate the protein-rich legumes in every possible way. Show-off, inflated egos, blindly aping the West, dismissing traditional cuisines because they are not “cool” ? 3) Curry leaves and drumstick leaves feature yet again in my list. Apart from protein, they are also high in calcium, iron, fibre and Vitamin A. If you don’t like to chew curry leaves, make it into a chutney podi and sprinkle on top of your protein-rich idlis or sabzis. 4) All varieties of beans such as cluster beans (guar / kothavarangai), broad beans (averakkai) and fresh peas are good sources of protein. Most of our Indian spices and condiments are also protein rich. Though we cannot consume 100 gms of say, methi seeds at a time, we can consume it in multiple ways throughout the day - a tsp of soaked methi seeds early morning, in sambhar or any gravy dish, roasted methi powder in rotis, pickles or thokkus, sprouted methi in salads etc. Instead of gulping down a protein-loaded shake in one meal, it is beneficial to make 3 wholesome, balanced meals with various sources of protein, thus providing opportunities for our body to absorb all essential amino-acids. 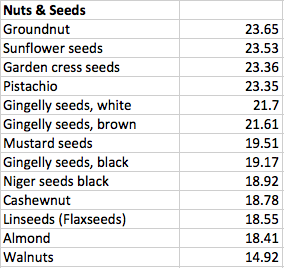 5) All nuts and edible seeds are rich sources of protein. Add a handful of groundnuts in poha for breakfast or add it to your salads - steamed or roasted. A handful of almonds, cashews, pistachios and walnuts will not only give you adequate protein but also essential fats. Sprinkle a tsp of toasted sesame seeds in your salads, add it to your parathas, make a chutney podi, make laddoos with jaggery - sesame seeds are so versatile and super healthy. They are the richest source of calcium too. If you still believe that milk is essential for children because of high protein, well, let me share the facts - around 100 ml of whole milk (cow’s) contains only 3.26 gm of protein. The dairy industry has brain-washed us enough into believing that milk is high in protein, high in calcium and a mandatory food for children. None of this is true. It’s high time we question such beliefs that are blindly being passed on from one generation to the next. “Anything in excess is bad” - this principle holds true for protein as well. A high protein diet can lead to kidney damage because of the excess strain on the kidneys. More details in this NYTimes article.